Jackso.com was a new Hong Kong a deal-of-the-day website featuring discounted gift certificates usable at local businesses, targeted to teenagers and young adults launhed in 2009. Client brief requested the website logo, offline stationery and a basic brand guideline. "Jack So" sounds like a Cantonese male name, and the pronounication means "good deal" in Cantonese. 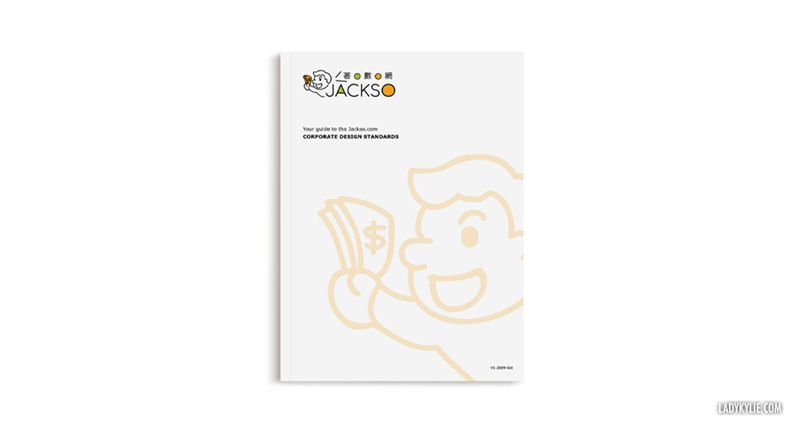 As targeed to young adults, the client wish to have a cartoon image (who is the "Jack So" guy) included in the logo with bright colour such as yellow, orange and lime green. The final version bilingual, and the brandguide below. Basic logo information, placement, fonts, colours. Name card, Letterhand, Envelope etc. Before we commited the stationery, I've show the client options before putting into the brandguide. We go for the left set. And beside putting the stationery into the guideline, ai files were also provided.